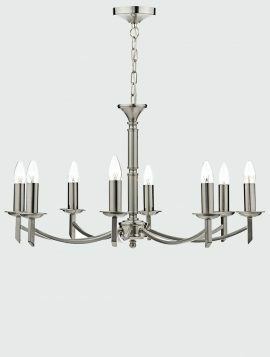 The Ambassador 5 light chandelier is finished in a satin nickel and features a ribbed central column. 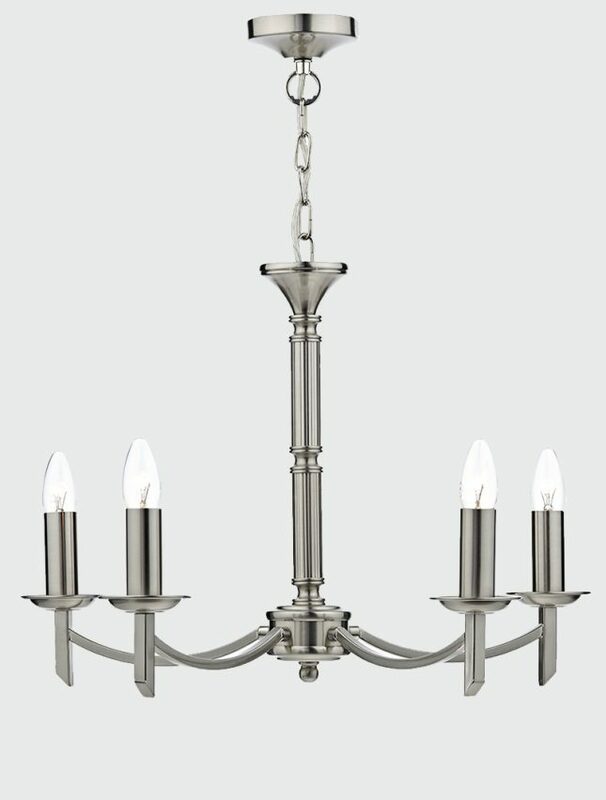 This fitting comes with candle sleeves allowing you to use it with or without shades and has a complimenting satin nickel chain and cable which adjustable on installation to a maximum height of 86cm. The Ambassador can be adjusted to be a semi flush ceiling light. Add a classic contemporary look to your home. Also available in: Bronze. Complete the look with the 8 Light Chandelier. Don't forget your light bulbs! Order now for delivery within 3-5 days. 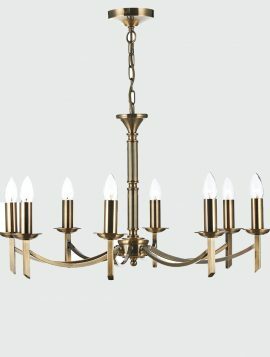 The Ambassador 5 light chandelier is finished in an antique brass and features a ribbed central column. 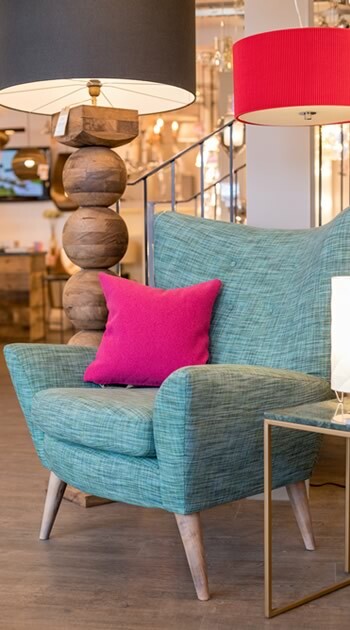 This fitting comes with candle sleeves allowing you to use it with or without shades and has a complimenting antique brass chain and cable which adjustable on installation to a maximum height of 86cm. The Ambassador can be adjusted to be a semi flush ceiling light. Add a classic contemporary look to your home. Also available in: Satin Nickel. 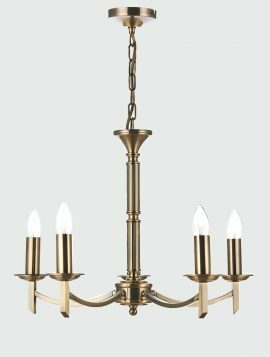 The Ambassador 8 light chandelier Bronze is finished in an antique brass and features a ribbed central column. This fitting comes with candle sleeves allowing you to use it with or without shades and has a complimenting antique brass chain and cable which adjustable on installation to a maximum height of 142cm. The Ambassador can be adjusted to be a semi flush ceiling light. Add a classic contemporary look to your home. Also available in: Satin Nickel. Complete the look with the 5 Light Chandelier. 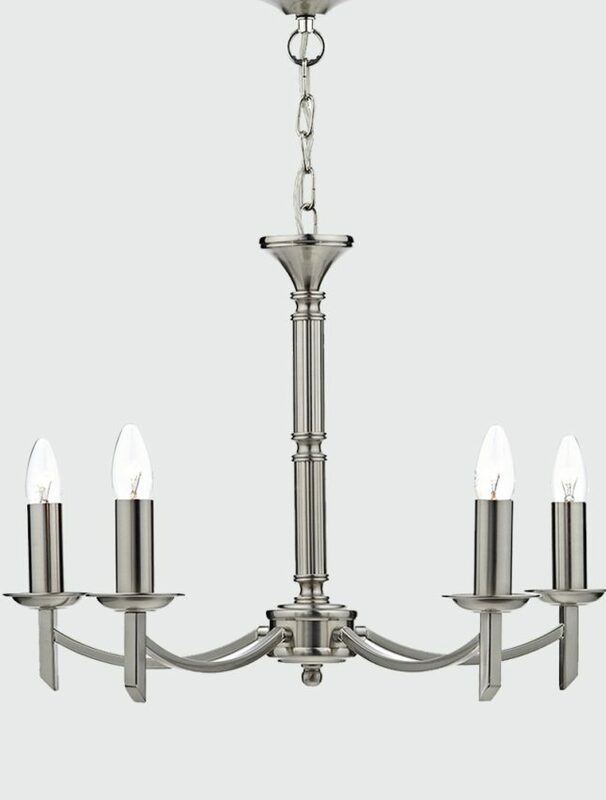 The Ambassador 8 light chandelier is finished in a satin nickel and features a ribbed central column. This fitting comes with candle sleeves allowing you to use it with or without shades and has a complimenting satin nickel chain and cable which adjustable on installation to a maximum height of 142cm. The Ambassador can be adjusted to be a semi flush ceiling light. Add a classic contemporary look to your home. Also available in: Bronze.